home > topics > microsoft access / vba > questions > how to lookup an image on report?? This is my table named "Company"
I want to show my "logo" on my whole reports. For this purpose I have used DLookUp function which is given below but it works only once. After re-opening the database has shown me an error "Run-time error '2220'. What should I do to show logo on my reports. 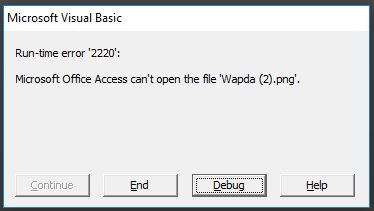 This error usually means that the image file cannot be located at the path given. Both TwinnyFo's method and the method in my subsequent post therein can be altered to work for reports as well as for forms. You may also find Why Values in Unbound Form Controls do not Persist helpful. If you want to show multiple logos you'll need to bind the control to the field.